Lately, I have been working to assimilate these two truths. In my own life, anger has been an idol and my worship at its altar has come at the cost of my own soul, my own effectiveness as a minister, and as a person in relationship with those that I love. Second, when anger is displayed in public, whether in a church meeting or in a family dinner table discussion, the harm that ensues is always greater than we can calculate. Further, in retrospect I see, that everything that I labeled as righteous anger was, in fact, dumb anger. 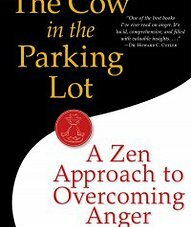 Imagine that you are at the mall on a crowded day looking for a parking space. The lot is nearly full, but in front of a you an elderly person is slowly backing out of a prime space. You wait patiently for them to execute a three point turn. Just as you prepare to enter your space, a young man in a red sports car zooms into it from nowhere. You beep. He gives you an obscene gesture. At this point your options are limited. You could leave a note or damage his car. You could stew about it for a long time and tell your friends. Whatever you choose, your only useful action will be to find another parking space. Imagine the same story with one detail changed. You, again, are waiting for the prime space. This time, as you are ready to drive in, a cow ambles into the space. You beep, she moos. Later you learn that the cow has a habit of doing this every day. She, too, has been waiting for that parking space. What remains the same in the two stories is that your only useful action is to go an find another space. What is different, besides the fact that the second gives you a humorous story to tell your friends, is that with the cow, we have no expectation of changing the other person. The people who cause us to lose our temper, tend to be those we judge as needing taught a lesson. No matter how much someone has wronged us, our next useful action usually doesn’t involve them. We have to go find another parking space. Having done that, why is the attitude of the driver in the red sports car any more our responsibility than the attitude of the cow? Reflecting upon my own life, I find that I have been most dangerously angry when I felt I needed to change someone else. Jesus was rarely angry. He only taught those who came to him and he tended to advocate letting people find their own path. Even when the person who makes us angry is our dependent or related to our vocation, we do well to step back and ask if our emotion and actions are actually helping that person to discover for themselves the right way live. We are rarely as responsible for someone else as our anger god wants us to be. If you love like Jesus did, you do a lot of letting go.